Good morning Cottage Cutz fans! There is still time to enter the first Scrapping Cottage Challenge for a chance to win a $25.00 gift certificate to The Scrapping Cottage Store. We have had some wonderful entries! You can read all the details here. Kay will be posting challenge #2 on Saturday, June 11. Now on to my card for today. I used the cherry pie slice from the In The Kitchen Clear Stamps and the tiny cherry stamp from the Homemade Tag Clear Stamp. I also used the Circles With Eyelets die for the cherry pie slices. I love to use stamps to create background papers. For this card I used the tiny cherry stamp from the Homemade Tag Clear Stamp. If you have been following me for awhile, you know that I love cherries. I have made many cards with cherries on them and never grow tired of them. When I lived in Wisconsin we used to go cherry picking. YUM!!! 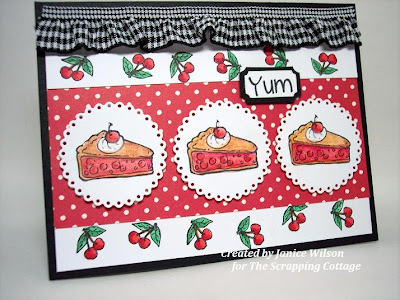 I have cherry decor in my kitchen, on plates and towels...... well you get the idea. I stamped the pie slice three times and colored with Prismacolor colored pencils. I cut the pie slices out and mounted them on the small circles from the circle eyelet die. If I had known my final design of the card I probably would have stamped the slice onto the circles, although I do like the added dimension from cutting them out. If I needed to make a lot of the same card, I think stamping directly to the circle would be the way to go. 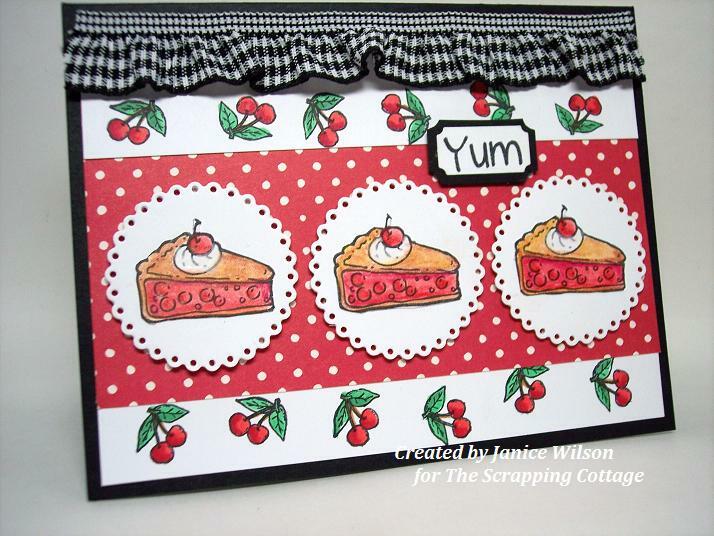 The YUM sentiment is from the Kitchen Clear Stamps, and I used some ruffled black gingham ribbon to finish the card. Thanks so much for having a look! I LOVE this card, Janice! You know I love it when you go country with your cards. They're right up my alley, and this one is as cute and cheerful as they get. Beautiful work on the background, and your coloring is perfect!! Great job! Oh Janice,how did you know cherry is my favorite!!!! I LOVE this cute cheerful and delicious looking card. Great job!! !